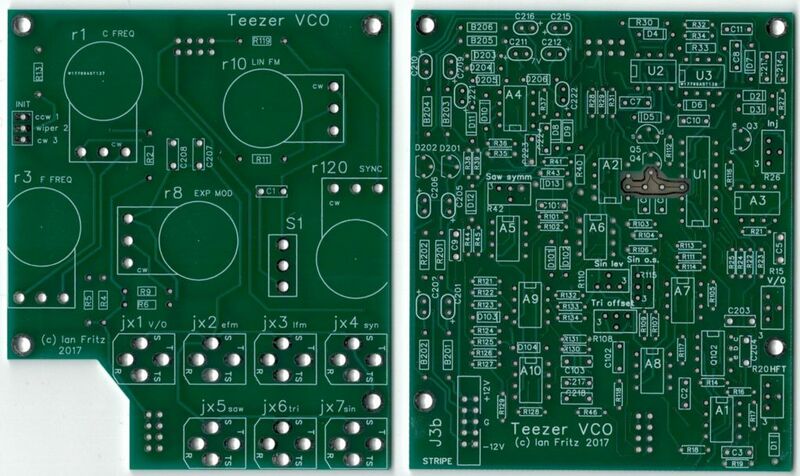 We are very pleased to announce availability of the Ian Fritz Euro Teezer Thru-Zero VCO. The aluminum euro panel design by clarke68 is 18hp- and is very complementary to the euro Threeler VCF design: they look great together! The PCB set has been tested and modified a bit from earlier Teezer versions, optimized for 12V. special gratitude to ian fritz for collaborating with us, and to our beta testers clarke, mike, pete, raph and quincas! This is excellent - so happy to see this in Euro! I'm a huge fan of Ian's designs. Can you provide more information on the dual-gang tuning pot (R12)? I didn't see any information on that in the BOM. Is it a 10-turn, and do you have a recommended part number? Also, about the turn-counting dial - do you have a suggested part number for that? What is a recommended outside diameter? Thanks, and thanks for bringing this product to the DIY community! 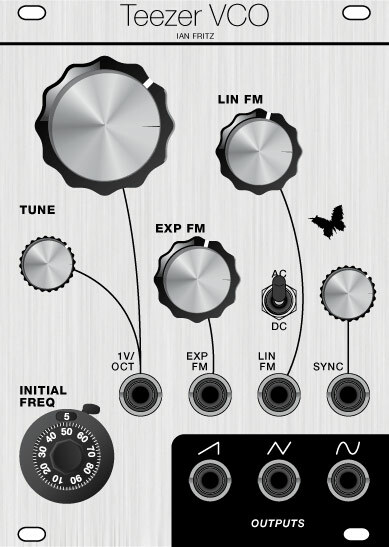 Here's the BOM we are using for first run kits including the multiturn pot and Bourns multi-turn dial P/Ns... these are not inexpensive by comparison with 'average' eurorack controls but we felt that part of what makes Ian's Teezer design unique is that fine tuning initial frequency- so we kept it! Thanks for clearing that up. This is super exciting! Having some trouble checking out on the SynthCube site. Sent you guys an email about it through the contact form. yes, we're sorting some checkout issues resulting from recent changes to credit card compliance requirements... thank you for the patience! Looks great! But surely it's a "multi-turn" pot, not a "dual-gang" (ie stereo) pot? Or have I missed something! I just finished assembling one of these and the kit had another resistor included for R19. The BOM shows 470K and this one was 680K. I'm wondering if that's on purpose? I partly ask because right now it's not working right, I get a rather slow saw (down ramp, is that right) and triangle but no sine.. and neither the init freq or coarse tune knobs affect the frequency. No obvious soldering issues or mis-stuffed parts found yet, I'm done DIY for the night and will pick up tomorrow after studying the schem a bit more. R19 should be 470K per the latest BOM and schematic from Ian.